Remember those two crazy stories I posted last year called The Wig? Well, it’s back! 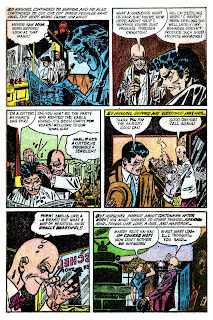 Sort of… yes, as we kick off a Don Heck Tribute Weekend (as well as our continued look at Comic Media’s Horrific series) here comes yet another shocking tale about a demented bald barber with a real headful of trouble. Also see: The Wig: HERE… and HERE! TOMORROW: One Heck of a Sunday! Awww, poor Hirschel. Funny story, i prefer it to both versions of The Wig. Heck shines, his much criticized style was perfect for these types of stories. What an interesting use of words. "Tonsorial" is used quite correctly within the story, but not at all correctly in the intro. Might I suggest "pilar"? Plus, I have no idea how a vampire is a "cutter", nor do I get why Mary Lou's death was a "homecoming". I think I like the werewolf version of this story better, but I pretty much say that about all the old standards. This is the funniest thing I've seen in a while. Unintentionally, of course. It's stupid for a hundred reasons, but it's awesome for the exact same hundred reasons. I love the ridiculous sudden ending. Lol, where to begin? I liked the story at "tonsorial", which was funny. I guess this was the only vampire in the history of vampires who got caught because some eagle-eyed customer spotted dandruff on his coat. Vampire dandruff, now I have seen it all! What nice artwork. I don´t get it. I don´t like Heck as I always thought his Marvel work so uninspired. This here on the other hand is alive and full of little details. This is the same artist who drew this dull and lame Iron Man? Pretty good one. :) Agree with Horror pariah, fine work by Heck. 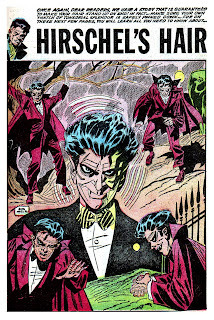 Casts serious doubt on the "Vampires don't reflect" tradition, of course - what's a barbershop without mirrors? HAAAAAAA! THE ENDING HAD ME ROLLING ON THE FLOOR. REALLY NICE ARTWORK, I'VE ALWAYS LOVED DON HECKS ART....... YES ANDY EVEN THE LAME IRON MAN. REAL GOOD STUFF, LOOKING FORWARD TO TOMORROWS POST. THE AD IS A CLASSIC TOO! This artwork is GORGEOUS!!! I know a lot of folks tend to look at Heck's Marvel superhero style as being "lame" which I find to be a bit harsh, but I see what they're saying. 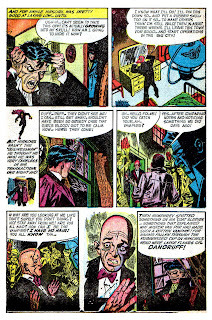 If, however, you look at Heck's early Marvel "monster" work, and even his early Ant-Man stuff, you'll see how good he really continued to be. The reason for his alleged deterioration can probably be attributed to the fact that early on in his career, Heck was doing 8 pagers. Maybe even as few as 8 pages a month. When he then had to suddenly start turning out 16 and 22 pages a month (especially under such writers as Stan lee and Roy Thomas where he basically had to work out the pacing and even the plotting himself) his work suffered. 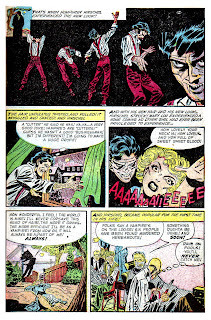 Some guys like Kirby and Ditko flourished under this system, but most comics artists (as any reasonable person should expect) faltered somewhat under the strain. Again, I understand why people say what they do about Heck, but Karswell has done us all a great service here by showing us what Heck was really capable of at his best. The fact that he managed to continue to produce professional -- if not always exceptional -- work even under the duress of "Marvel style" writing is a testament to his true skills. I would also say that if any of you artists out there think it's so easy, call me up and I'll describe a 22 page story over the phone to you -- the way Stan often did -- and see what you come up with. Again, Karswell, thanks so much for giving one of my favorite artists the props he deserves simply by showing us this beautiful story. Page two is amazing! You've had the answer to hair loss all these years and withheld it from me? You sir are indeed evil. Geez... the guy's bald, so everybody treats him like he was slimy pornographer or something. "Ha ha, he's ugly and BALD!!" "I can't marry you! You're BALD and disgusting!!" He's not very handsome... but everybody hates him 'cause he's... he's BALD! Uh, so apparently Hirschel and the townfolk and the other readers and everybody but me already knew about some important association between hair and vampirism. From the desk of the Bureau of Redundancy Bureau's desk. "Once you're bald, that's it, friends! There's nothing you can do. Your hair is gone forever. So are your chances of getting it back." Your head will be barren for the rest of your life, no matter what. 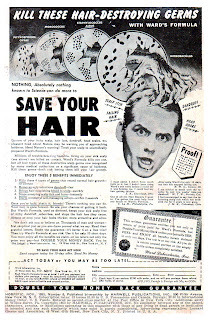 Because you won't have any hair -- ever again!!! Whatever you may try, you won't see hair on your head again once you don't have it. It's impossible! It will be a smooth scalp you take to your grave. No more hair for you. My turn to be redundant-- thanks for the comments today people, I really love all the funny observations and occasional insider info we get around here. Makes it all super fun! 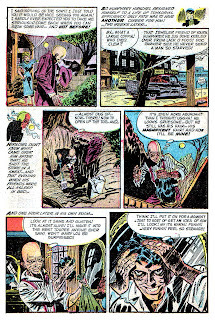 And to complete our Don Heck Weekend we will of course have more Don Heck tomorrow... but to make it even more interesting (since some of you were mentioning his Silver Age work here today) I will post a pre-code story as well as one from his later years for comparison. See ya in the mourn! 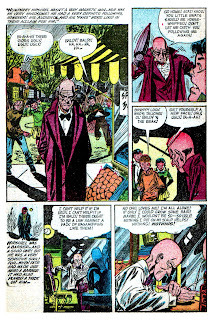 Speaking of Heck's Iron Man, I recently came across an old battered issue of Iron Man which unusually (not being Kirby, Adams or the like) I'd kept rather than traded as a kid. At the time I remember not being too impressed by what I considered the rather lack lustre action scenes in the issue. The artist just didn't seem suited to 'The Marvel Way'. But there must have been a certain quality about the work that I thought the comic was worth hanging onto. It was drawn by some artist, unknown to me at the time ... called Johnny Craig.